“He who sees only fashion in fashion is a fool”, proclaimed Honoré de Balzac in his Treatise on Elegant Living. Fashion means way of taking an attitude, way of primping. This term, especially if we consider the past, is usually referred to the aristocracy, yet the costume trends, even though delayed and modified, actually affect the lower class too. The 15th century was an age of sweeping changes and innovations, to such an extent that, according to some, it caused the transition from the Middle Ages to the Modern Era. During the first decades of the aforementioned socio-cultural context, fashion was still conveying the 14th c. vertical linearity, typical of the Gothic style; on the other hand, by approaching the threshold of the 16th c., the attire, as well as the physical type, assumed clearly renewed overtones. This rasearch aims to investigate the 15th c. Italian costume, exploring the male, female and infant clothing, together with their accessories, textiles and colors, by means of an interrelated study of original relics, documents, sumptuary laws and iconographic sources. 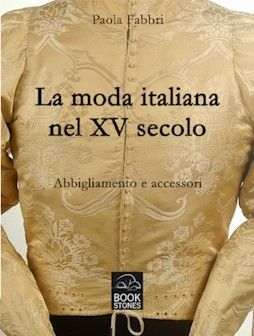 Thus the author attempts to highlight the complex sartorial structure of the main garments used by the different social classes, also presenting a few replicas, entirely handmade by herself, unveiling the value and the meaning ascribed to appearance at that time. “Chi vede nella moda soltanto la moda è uno sciocco”, sentenziava Honoré de Balzac nel Trattato della vita elegante. Moda significa modo di atteggiarsi, di agghindarsi. Con questo termine, soprattutto se guardiamo al passato, solitamente ci si riferisce alla classe blasonata ma le tendenze del costume, seppure in ritardo e modificate, di fatto coinvolgono anche i ceti più bassi. Last edited by Bartolo on Tue Nov 22, 2016 9:49 am, edited 1 time in total.